This assassin was a project that took me completely by surprise. 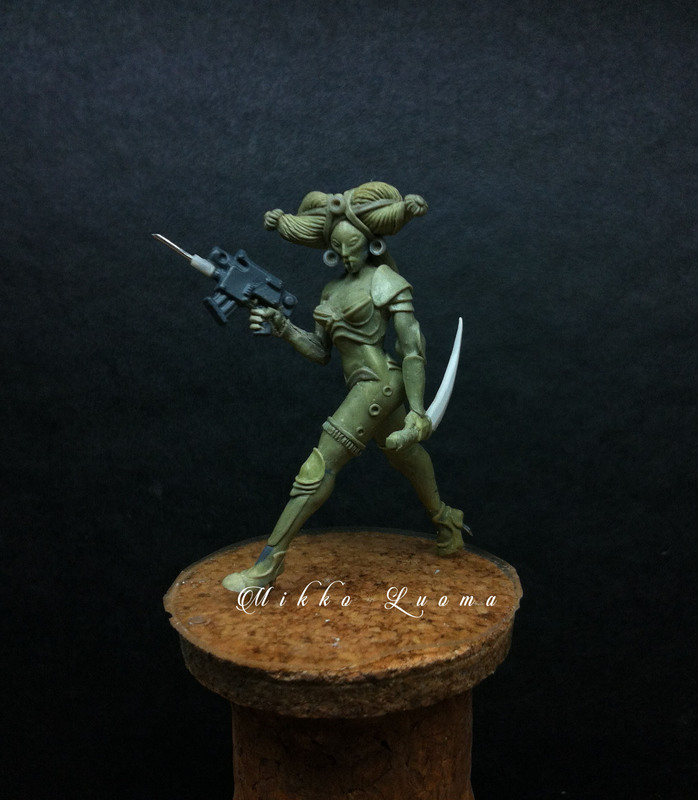 I started it as a simple conversion project but it got evolved into full-blown sculpting and I end up creating the character completely from scratch (well not completely, the bolt pistol in her hand is still GW part). Looking at these pictures here I see so many things that needs fixing but I am still little surprised how well it ended up… funny thing. Design wise she’s a real mess, I mean yes, and it shows, let me tell you what I mean… Like I wrote earlier, at first, she was supposed to be female Assassin in the spirit of blanchitsu but once I sculpted her face I noticed that it had this “Yoshitaka Amano vibe” going on so I got inspired by the concept of Space Vampires in 40k and so a pair of fangs appeared;) During the process I also got inspired by some very strange Chinese ritual head dresses so I had to add some of that too. That is brillant mate. I’m extremly impressed. If you ever decide to restart the miniature boutique company you mentioned in the past you can count as a customer. If you are in down time Helsinki sometime let me know and I’ll buy you a beer. I think that is a great figure, and there is certainly room for it in the 40k universe. part of the disconnect you are experiencing may be due to the lack of skulls, hoses, pouches, purity seals and all the other details that take a historical costume and translate it into “Grim Dark Future”. Really of the big art!!! Fangs are hard to convincingly create in this scale =) so tiny!!! Don’t get me wrong, I think they still look great. Female models of any type are so rare in the 40k universe that it is so refreshing to see such an excellent rendition!! Nah, that”s a brilliant piece of 40k all the way. She’s like a character out of an Abnett book. Gorgeous stuff! I think you’ve actually managed to sculpt a miniature which is so beautifully 40k and yet avoids all of the 40k clichés (which is probably why it doesn’t immediately scream 40k at first sight). There’s something more than a little Gigeresque about it too. Amazing work. I agree that the model has a distinct 40k vibe without the overdoing tropes and cliches. Loved the hair and the quite alien face. Wonderful, fantastic, amazing… Just some of the words that spring to mind, usually preceded by another word beginning with ‘f’. 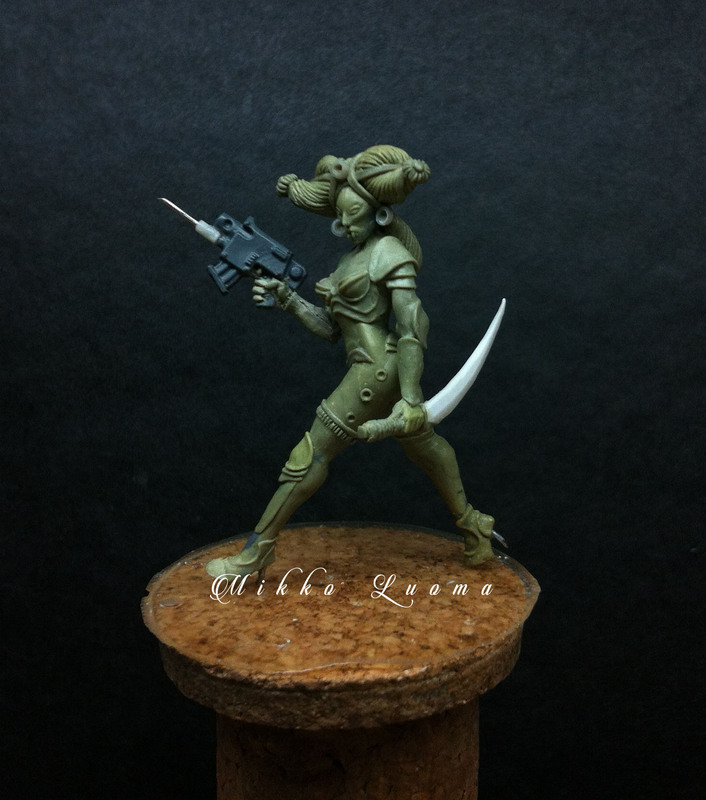 Can you give us any hints on how you might paint her? Nice sculpting! Very cool model. 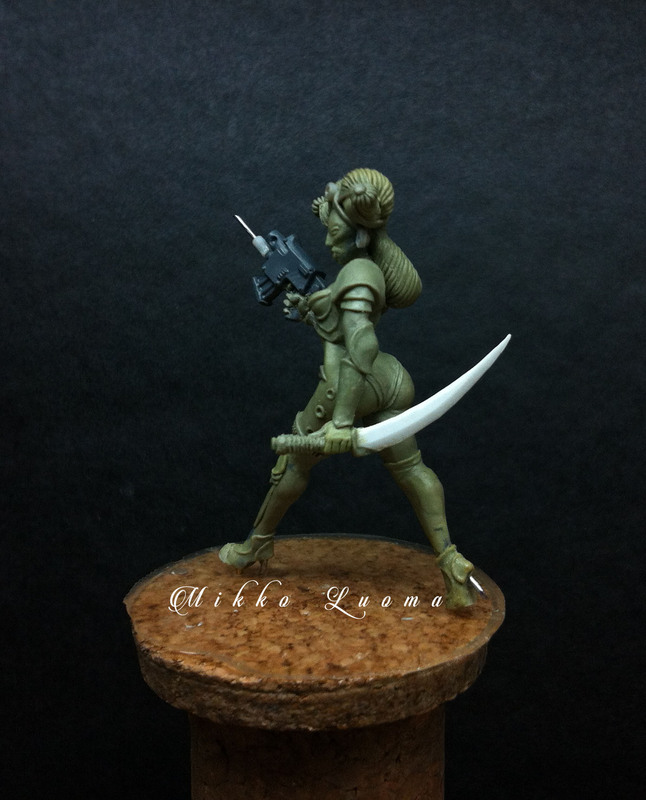 It’s an amazing incredible sculpt – I love the hair, the posing, the clothing – and so perfectly executed. No, it doesn’t immediately say 40K, but it probably only needs some very small additions to make it fit the 40K universe. She reminds me of an ‘upper hiver’, you know from one of the noble houses… what’s her name, Mad Donna Ulanti. Awesome! I like it that it’s not the stereotypical 40k image going on. Despite it being a huge universe, a lot of the imagery gets recycled, so the characters in it become quite repetitive or predictable. This is something new and fresh, yet would still fit. Perhaps from some distant planet that has it’s own cultural identity..?